A Base Lab Tools Exclusive! 1" thick solid aluminum breadboards. These breadboards provide extra rigidity in applications where a solid, uniform material is required. 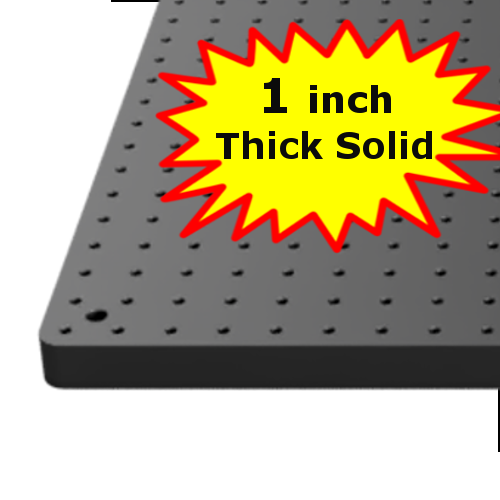 Our 1inch thick breadboards still have a full 1" grid of 1/4-20 tapped holes (25 mm grid of M6 tapped holes for metric parts) and at least 5 counter bore mounting holes. Base Lab Tools "Extra Thick" series of solid aluminum breadboards are built to order with a fast, 2-4 week lead time, 10 days for unanodized! Not quite what you need? Submit your drawing via our Custom Aluminum Breadboard Request Page.